I know we’ve had many lively discussions at INANE meetings about author contributions to an article, duplicate publication and so on. 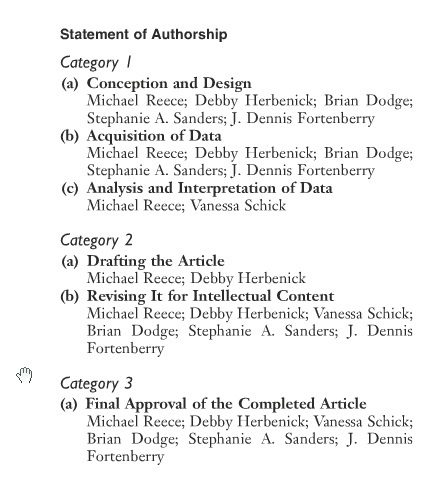 I think we all have different ways we handle the issue of assessing and documenting that all the listed authors have contributed to the writing of the article. This guidance comes from our publishers as well as our own personal preferences and beliefs. For my journal, CIN: Computers, Informatics, Nursing, I have all authors have to sign a statement that affirms that they have substantially participated in the writing of an article. I was reading an article in the Journal of Sexual Medicine and came across this, which I thought might be of interest to the group. I have been pondering if I want to change my procedure to include something like this. I am throwing this out to my colleagues for discussion. Are any of you requiring statements such as presented above? Why or why not? If yes, is it working well? Are authors able to easily give you the documentation you request? Or do they see it as another bit of busy work that we pesky editors require? This entry was posted in Discussion, Editing and tagged authorship, editorial role by Leslie. Bookmark the permalink.